For other uses, see Enchanted Forest (disambiguation). 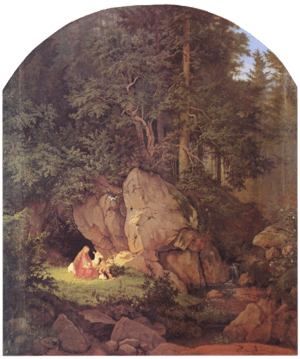 "Genoveva in the Forest Seclusion" by Adrian Ludwig Richter – a refuge and a magical deer. The forest can feature as a place of threatening danger, or one of refuge, or a chance at adventure. The forest as a place of magic and danger is found among folklore wherever the natural state of wild land is forest: a forest is a location beyond which people normally travel, where strange things might occur, and strange people might live, the home of monsters, witches and fairies. Peasants who seldom if ever traveled far from their villages could not conclusively say that it was impossible that an ogre could live an hour away. Hence, in fairy tales, Hansel and Gretel found a cannibalistic witch in the forest; Vasilissa the Beautiful encountered Baba Yaga herself; Molly Whuppie and her sisters ran into a giant. It was in a forest that the king of The Grateful Prince lost his way, and rashly promised his child for aid, where the heroines, and their wicked stepsisters, of The Three Little Men in the Wood and The Enchanted Wreath met magical tests, and where Brother and Sister found the streams that their evil stepmother had enchanted. In Beauty and the Beast, Belle's father is lost in the forest when he finds the Beast's castle. The evil cat-spirits of Schippeitaro live in the forest. 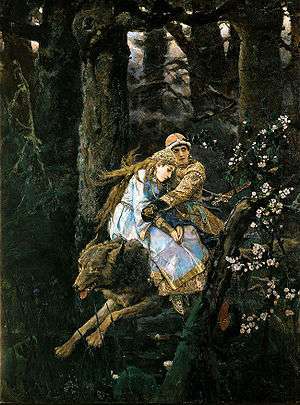 In Tsarevitch Ivan, the Fire Bird and the Gray Wolf, the hero, heroine, and wolf travel through the forest. Indeed, in Grimm's Fairy Tales, the hero always goes into the forest. It is not itself enchanted, but it contains enchantments and, being outside normal human experience, acts as a place of transformation. The German fairy tale has an unusual tendency to take place in the forest; even such neighboring countries as France or Italy are less like to have fairy tales situated in the forest. Even in folklore, forests can also be places of magical refuge. Snow White found refuge with dwarfs from her stepmother, The Girl Without Hands found a hut to stay in when she had been slandered to her husband, and Genevieve of Brabant found not only a refuge from slander but a doe magically came to her aid. Even Brother and Sister hid in the forest after their stepmother turned the brother into a deer. At other times, the marvels they meet are beneficial. In the forest, the hero of a fairy tale can meet and have mercy on talking animals that aid him. The king in many variants of the ballad The Famous Flower of Serving-Men finds an enchanted hind that leads him astray uncanny, but it brings him to a talking bird that reveals to him a murder and that a servant of his is actually a woman, whom the king then marries. It is in the forest that the dwarf of Rumpelstiltskin and the fairy of Whuppity Stoorie reveal their true names and therefore the heroines of those tales have a way to free themselves. In Schippeitaro, the cats reveal their fear of the dog Schippeitaro when the hero of the tale spends the night in the forest. The creatures of the forest need not be magical to have much the same effect; Robin Hood, living in the greenwood, has affinities to the enchanted forest. Even in fairy tales, robbers may serve the roles of magical beings; in an Italian variant of Snow White, Bella Venezia, the heroine takes refuge not with dwarfs but with robbers. In Norse myth and legend, Myrkviðr (or Mirkwood) was dark and dangerous forest that separated various lands; heroes and even gods had to traverse it with difficulty. Romans referred to the Hercynian Forest, in Germania, as an enchanted place; though most references in their works are to geography, Julius Caesar mentioned unicorns said to live there, and Pliny the Elder, birds with feathers that glowed. 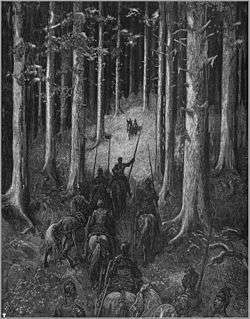 Gustave Doré’s illustration to Orlando Furioso: a knight and his men see a knight and lady approach in the forest. Giacinto Gimignani, Rinaldo and Armida meet in the enchanted forest in Jerusalem Delivered. and such ladies could be not only magical aid to the knight, but ladies for courtly love. Huon of Bordeaux met the fairy king Oberon in the forest. Guillaume de Palerme hid there with the princess he loved, and found a werewolf who would aid him. In Valentine and Orson, the Queen is sent into exile and so forced to give birth in the woods; one child, taken by a bear, turns to a wild man of the woods, who later aids Valentine, his long-lost brother. In the "Dolopathos" variant of the Swan Children, a lord finds a mysterious woman – clearly a swan maiden or fairy – in an enchanted forest and marries her. Genevieve of Brabant, having rebuffed a would-be lover and found herself accused of adultery by him, escaped to the forest. This forest could easily bewilder the knights. Despite many references to its pathlessness, the forest repeatedly confronts knights with forks and crossroads, of a labyrinthine complexity. The significance of their encounters is often explained to the knights – particularly those searching for the Holy Grail – by hermits acting as wise old men – or women. Still, despite their perils and chances of error, such forests are places where the knights may become worthy and find the object of their quest; one romance has a maiden urging Sir Lancelot on his quest for the Holy Grail, "which quickens with life and greenness like the forest." Dante Alighieri used this image in the opening of the Divine Comedy story Inferno, where he depicted his state as allegorically being lost in a dark wood. In the Renaissance, both Orlando Furioso and The Faerie Queene had knight-errants who traveled in the woods. In Jerusalem Delivered by Torquato Tasso (1581), enchantments placed on the only forest near Jerusalem prevent the Crusaders from constructing siege engines for most of the epic poem, until they are broken by Rinaldo. While these works were being written, expanding geographical knowledge, and the decrease of woodland for farmland, meant the decrease of forests that could be presumed magical. In A Midsummer Night's Dream, William Shakespeare wrote of a forest that was enchanted specifically by the presence of Oberon and Titania, the fairy king and queen; like many forests in Shakespeare's works, it becomes a place of metamorphosis and resolution. Others of his plays, such as As You Like It, take place in a forest, which contains no enchantments but acts much as the forest of folklore. The forest is often filled with magical animals, plants, maybe even magical rocks and creeks. Often there will be Dragons, Dwarfs, Elves, Fairies, Giants, Gnomes, Goblins, Imps, Ogres, Trolls, Unicorns, and other mythical creatures. The vegetation consists of trees that talk or with branches that will push people off their horses, thorny bushes which will open to let people in but close and leave people stuck inside, and other plants that move, or turn into animals at night, or the like. Some stories have sorcerers and witches living somewhere in the depths of the forest. Perhaps there will even be creeks which will turn unwary travelers into frogs if drunk from. The use of enchanted forests shaded into modern fantasy with no distinct breaking point, stemming from the very earliest fantasies. In George MacDonald's Phantastes, the hero finds himself in a wood as dark and tangled as Dante's, una selva obscura that blots out sunlight and is utterly still, without any beasts or birdsong. The more inviting but no less enchanted forest in The Golden Key borders Fairyland and draws the hero to find the title key at the end of the rainbow. In The Wonderful Wizard of Oz, L. Frank Baum depicted the wild and dangerous parts of the Land of Oz as being forested, and indeed, inhabited with animated trees with human-like traits, a common feature in children's literature. William T. Cox in his 1910 work Fearsome Creatures of the Lumberwoods based the entire book off of actual forests across North America; however, the author combines these factual locations with fantastic encounters between lumberjacks and mysterious creatures. J.R.R. Tolkien made use of forests as representing enchantment and the ancientness of the world: Mirkwood, Fangorn forest, and the Old Forest. He also made use of folklore about trees, such as the willow, believed to uproot themselves and stalk travelers, in Old Man Willow. His elves are strongly associated with forests, especially Mirkwood and Lothlórien. Still more, Tom Bombadil is a genius loci of the Old Forest, the wooded land about the Shire, and the ents act as the forest come to life. Following J.R.R. Tolkien's work, the enchanted forest is often a magical place in modern fantasy. It continues to be a place unknown to the characters, where strange dangers lurk. The Enchanted Forest is particularly close to folklore in fairytale fantasy, featuring in such works as James Thurber's The White Deer and The 13 Clocks. In the contemporary fantasy Harry Potter books, the Forbidden Forest near Hogwarts is forbidden because of its magical nature. The home of unicorns, centaurs, and Acromantulas (a race of giant spiders), it continues the tradition of the forest as a place of wild things and danger. In Suzanna Clarke's Jonathan Strange and Mr. Norrell, the Raven King's capital city of Newcastle in Northern England was surrounded by four magical wood, with names like Petty Egypt, and St. Sirlow's Blessing. These forests were supposedly enchanted by the Raven King himself to defend his city. They could move around, and supposedly devoured people approaching the city with the intent of bringing harm to it. Clarke brings the notion of magical places to life by contrasting this historical account within the story itself, to the actual depictions of magical woods within the story, where the trees themselves can be regarded as friend or foe, and have alliances formed with magicians. In My Neighbor Totoro, the forest home of the Totoros is an idyllic place where no harm will come to the heroines of the movies. In contrast in the Touhou Project series by ZUN, the Forest of Magic is an extremely dangerous place crawling with Youkai. In Once Upon a Time, the Enchanted Forest is the main setting that is located in the Fairy Tale World. It is often shown to viewers in the flashbacks of those who live there ever since the Dark Curse enacted by the Evil Queen and her followers brought them to Earth in the form of Storybrooke. Some of the known locations include Aurora's Palace, the Beanstalk (which leads up to a kingdom of giants), a kingdom that was formerly ruled by King George, the Dark Castle (where the current Dark One named Rumplestiltskin lives), the Dark Dungeon (which Rumpelstiltskin was once imprisoned and was built by Dwarves), the Dark Palace (where the Evil Queen rules after poisoning Snow White's father King Leopold), Demon's Bluff, Firefly Hill, the Forbidden Fortress (which serves as a retreat for Maleficent), a Gingerbread House (where the second Blind Witch resides), Glinda's Pocket Dimension, Granny's House (where Red's grandma resides), Hamelin (where Peter Pan posed as a Pied Piper to bring children to Neverland), Hangman's Island (which is somewhere near the Enchanted Forest), a House and Stables (where Cora and Henry raised a younger version of the Evil Queen), the Infinite Forest (a forest that loops around and traps those who enter it), King Midas' Kingdom, Lake Nostros (a lake with waters which can magically restore something or someone to a former state which is guarded by a Siren), Maurice's Castle (where Sir Maurice lives), Mulan's Home, Nottingham, Prince Eric's Kingdom, Rapunzel's Tower, Rumplestiltskin's House (where Rumplestiltskin raised Baelfire), Ruth's Sheep Farm, the Seven Dwarfs' Cottage, Sherwood Forest, the Safe Haven (a community in the corner of the Enchanted Forest that served as a refuge for those who weren't affected by the Dark Curse), the Troll Bridge, and the Werewolves' Den. There is also a desert that separates the Enchanted Forest from Agrabah. In "A Tale of Two Sisters," the Enchanted Forest's real name is revealed to be Misthaven and is across the sea from Arendelle. The Enchanted Forest is featured in Ever After High. It is a location in the Fairytale World that is located next to Ever After High and the Village of Book End. The students of Ever After High hang out there often....Especially when the students need time alone. For this purpose, there's a gazebo located deep in the forest. There is an orchestral interpretation of The Enchanted Forest. It was written by Loris O. Chobanian and given a world premiere in 1998 by the Heights Chamber Orchestra under the direction of Eric Berken. The work is for orchestra and narrator. It is a Middle-Eastern variation on the European themes of the myth. The performance can be found here. 1 2 Andrew Lang, The Violet Fairy Book, "Schippeitaro"
↑ "The Famous Flower of Serving-Men"
↑ John Rhys, "Whuppity Stoorie", Celtic Folklore: Welsh and Manx. Oxford: Oxford University Press, 1901. Volume 2. 1 2 Holt, J. C. Robin Hood p 9 (1982) Thames & Hudson. ISBN 0-500-27541-6. ↑ Laura A. Hibbard, Medieval Romance in England pp. 240-1 New York: Burt Franklin, 1963. ↑ "Cox, William T. with Latin Classifications by George B. Sudworth. Fearsome Creatures of the Lumberwoods. (Washington, D.C.: Judd & Detweiler Inc., 1910". Fearsomecreaturesofthelumberwoods.com. Retrieved 2014-12-19. ↑ Suzanna Clarke, Jonathan Strange and Mr. Norrell, London; Bloomsbury Publishing, 2004.